TULSA, Okla. (May 29, 2018) – The Tulsa Zoo is excited to announce the debut of its newest residents to the Mary K. Chapman Rhino Reserve: warthogs. This new-to-the-zoo species is now living with the white rhino, nyala and springbok antelope, and African crowned cranes on the 2-acre African grassland habitat. The three warthog sisters — Asha, Imara and Zuri — arrived from the Oakland Zoo late last year. Animal care staff have been slowly introducing the warthogs to the other species, allowing time for them to adjust to their new surroundings. 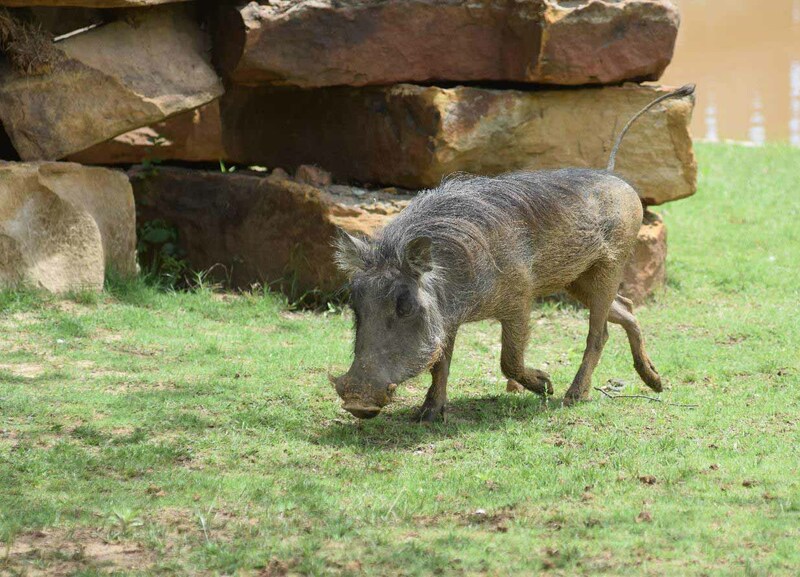 While animal care staff were seeing to the welfare and training of the three sisters, zoo operations and horticulture staff renovated the exhibit’s three yards for warthogs. They installed a dig barrier, modified the pipe fence and laid additional sod to accommodate the new species. The warthog trio have enjoyed exploring the exhibit together, digging and wallowing in muddy depressions throughout the exhibit. Far more social than male warthogs, females make a variety of vocalizations for communication. They can be seen, and heard, at the Mary K. Chapman Rhino Reserve. They communicate with grunts, chirrups, squeals and snorts which convey greetings, warnings and threats among other things. The most famous warthog is the fictional character Pumbaa from The Lion King. Warthogs have longer legs than most pigs, which allows them to doge and outrun potential predators. They can reach speeds of up to 34 miles per hour.